Wooden windows are an excellent choice if you have lot of wood in your home or if you are searching for more of a character look to your windows. These windows will provide great energy efficiency; however, they will require painting and they will be more costly than vinyl windows. 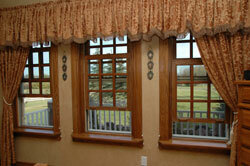 Contact us to learn more about wood window installation in Red Deer, Edmonton, Calgary and Saskatoon.